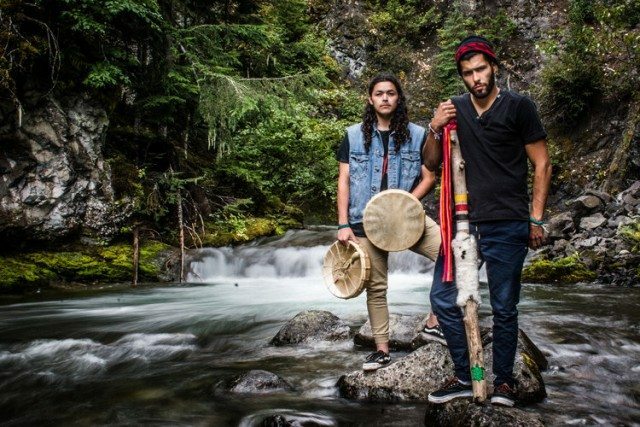 West Coast duo Mob Bounce headline the Unceded party at Harbourfront Centre tonight. Photo by Dale Cutler. The Harbourfront Centre has perhaps the widest array of programming this weekend, focusing on “thr creatvie contributions of Indigenous and newcomer Canadians,” as part of their Our Home On Native Land festival. There are daytime family friendly arts and crafts, food vendors, and performances all three days, with highlights including Kinnie Starr, Vox Sambou, and the Meegwetch Project—and late tonight, there’s the Unceded opening night party, with Mob Bounce, Boogey The Beat, and Narcy, going until 3 a.m. (It’s one of the few ticketed events, at $20). To July 3, Harbourfront Centre (235 Queens Quay West), Friday 6 p.m.-3 a.m., Saturday noon-11 p.m., Sunday noon-11 p.m., Monday noon-7 p.m., FREE – $20. Somewhere else to dance ’til late, for (almost) free: Hannah Spear hosts Good Sweat, a late night dance party after the comedy’s done at Bad Dog Theatre. Admission is pay what you can, and all proceeds will be donated to the charity Sistering. Bad Dog Theatre (875 Bloor Street West), 10 p.m., PWYC (all proceeds to Sistering). Politically thorny issues aside, getting the most out of Canada Day is all about the free entertainment—and fireworks, of course. You could start your day at one of Toronto’s cultural institutions, like the Royal Ontario Museum (which is hosting a special showing of Bryan Adams’ Canadians photo exhibit), The Gardiner Ceramic Museum, and the Bata Shoe Museum–they’re all free today. 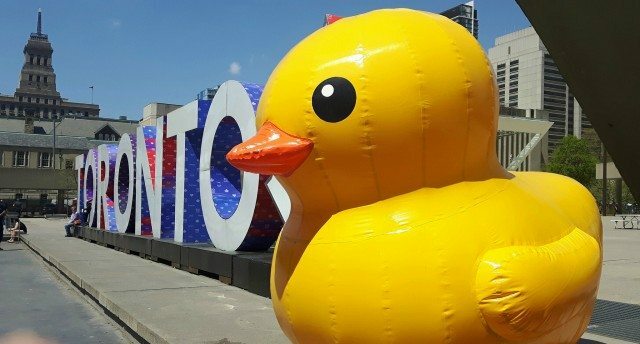 At City Hall, dozens of notable Canadian music acts will be playing the Nathan Phillips Square stage, including Ron Sexsmith, The Toronto Symphony Orchestra, and Born Ruffians—plus, acrobats, food trucks, and (of course) fireworks (which happen nightly from June 30 to July 3 at 10:55 p.m., akin to 2015’s displays during Panamania). Down by the waterfront, the Redpath Waterfront Festival has added two major additions along Queens Quay: HMCS Toronto, docked by Sugar Beach (and open for free public tours from June 30 to July 3), and the now-infamous giant rubber duck, which will be outside HTO Park July 1-3 (there’s a free Queens Quay shuttle connecting the two Waterfront sites). And of course, the waterfront will be the best place to watch the city’s largest fireworks display, at 10:45 p.m. (but there are a dozen more locations around the GTA). It’s the last day of the Toronto Jazz Festival, which has been programming special music events across the city (and here we must offer condolences to Aretha Franklin fans, as the legendary entertainer has had to postpone her appearance until next year’s festival). This final day sees free performances at Heliconian Hall and outdoor stages on Cumberland Street and Hazelton Avenue in Yorkville—and a special closing concert at the newly re-opened Concert Hall at the corner of Yonge and Davenport, featuring 4 By Monk By 4. Various venues and times in Yorkville (check website for details), noon-10 p.m., FREE – $60. A Monday without work to go to, what to do after brunch? Well, local indie musician Runt (not the artist) would like you to hear his new EP. Sitting in a Chrysler LeBaron. And wearing a sensory deprivation helmet. While attendees to his Mange EP Release and Listening Party take turns in the repurposed convertible, they can fuel up themselves with homemade pretzels and ice cream (so maybe don’t fill up too much at brunch). Little Sister (13 Mansfield Avenue, Unit G), 3 p.m., $5 (includes EP) -$10 (includes EP and food). To August 19, Young Centre (55 Mill Street), various times (check website for calendar), $25-$96. Chantel Marostica is on the Comedy Underground bill tonight. Photo by Corbin Smith/Torontoist. The second film and music pairing in this summer’s ongoing Open Roof Festival is Ben Wheatley’s 2016 Free Fire, a darkly funny shoot-out caper set in a warehouse in 1970s Boston (that was a hit in Midnight Madness series at TIFF ’16) and Tomi Swick; the Hamilton-based singer-songwriter plays first, and then the screening starts once the sun’s gone down. 99 Sudbury Street, doors at 7 p.m., band at 8 p.m., screening at 9 p.m., $15. 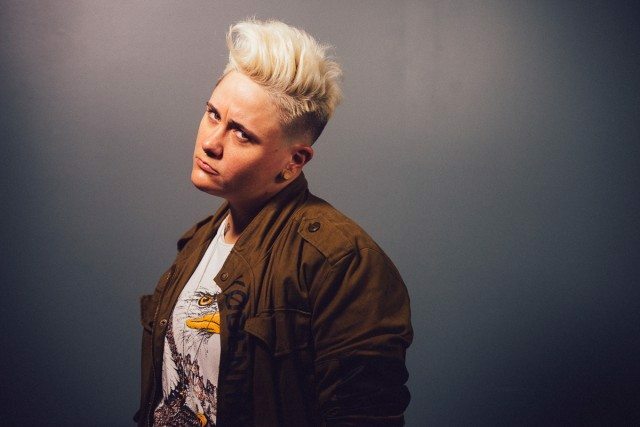 Weekly comedy showcase Comedy Underground has an especially strong line-up to open July, with host Mike Rita welcoming Chantel Marostica, Mark Forward, Evany Rosen and more. Drake Hotel Underground (1150 Queen Street West), 8 p.m., $10.